Did you know that every year, in the world of manufacturing and construction, about 150,000 employee injuries are reported? That’s one of the reasons the Occupational Safety and Health Act of 1970 (OSHA) was established— to ensure good conditions for America's working men and women by setting and enforcing standards, and providing training, education and assistance. One such bit of assistance comes in the form of establishing a list of personal protective equipment that employers must provide or reimburse you for. Commonly referred to as “PPE” the reason this type of equipment is used or worn by employees is to minimize exposure to a variety of hazards. Examples of PPE include such items as gloves, foot and eye protection, protective hearing devices, hard hats, respirators and more. In other words, equipment worn to minimize exposure to hazards that cause serious workplace injuries and illnesses. Depending on the industry, these injuries and illnesses may result from contact with chemical, radiological, physical, electrical, mechanical, or other workplace hazards. In some cases, those workplace hazards (injury and even death) could result from poisonous snakes— rattlesnakes, copperheads, water moccasins, coral snake, and others! Any kind of construction or manufacturing work calls for the need for proper footwear. Without it, slips, trips and falls are likely to occur. But if you’re working outdoors in rattlesnake country (oil & gas industry, landscaping, logging, utilities, surveyors, park rangers, etc.) you need protection from snake bite to potentially save your life! Rattlesnakes can be found in virtually every type of habitat in the Americas. Most live near open areas that have an abundance of rocks. This is because rocks offer cover from predators, and are also home to the rodents they feast on such as mice, lizards and insects. Rocks, too, provide places that rattlesnakes can bask in the sunlight to warm their bodies. Many rattlers also live in the deserts, marshes, prairies and forests. Although new species of rattlesnakes continue to be discovered, there are currently about 20 species in the United States. That’s a lot of snakes to be aware of! Think of PPE as a support system of sorts for the work your job requires you to do. PPE is equipment that will protect you against health or safety risks on the job. Working outdoors where vipers are known to live is physically demanding and much more hazardous than your average desk job, so your safety equipment should minimize that physical risk as much as possible. You have a lot to get done each day. Snake gaiters and snake proof boots can provide some peace of mind so you can focus on the task at hand. No form of snake bite protection can guarantee 100% protection, including the brands found on this website. 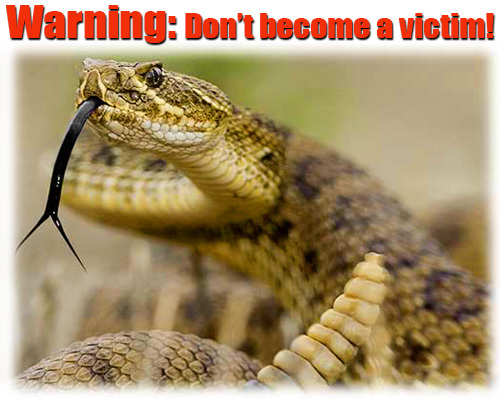 You must still be aware and vigilant while in snake habitat, but you can also reduce the risk of snake bite through prevention. Whatever footwear or legwear you choose, remember that it should fit properly and comfortably so follow the manufacturer’s wear and care instructions. Snakes bites are most prevalent between April and October, and although snakes are not "out to get you," bites can and do occur year-round. Prevention is best. Don't take a chance! Wear snake gaiters or snake boots or full protection snake chaps when in known snake country - whether that be the desert or woods - and greatly reduce your chances of deadly fangs penetrating your lower leg or foot. Keep this in mind when out having fun, too. Wear snake bite protection when hiking, hunting, fishing, and even working around brush piles in your own backyard.